Data Centre World is the world's largest exhibition for data centers. This is where you can discover all the latest trends and developments. More than 600 suppliers from the industry will be exhibiting, and of course we will also be there with our own stand. Once a year, you have the opportunity to meet thousands of experts in one place in just two days. STULZ is one of the world's leading solution providers of technology for energy efficient temperature and humidity management. Our product range includes traditional room cooling, high-density cooling, chillers, and air handling units with adiabatic cooling. We will be exhibiting an exclusive selection from our product portfolio over an area of 72 m2. Experts from each business unit will be at hand, to provide you with the best possible advice. So come and get to know us, and register for free. You also have the chance to see three of our experts live at this event. Don't miss this opportunity! 2017/3/15, 2:15-2:45 pm, presentation: "The Complete AirHandler Solution"
Ton Fens has accumulated over 20 years of experience in this sector. He is Director of AirHandler Sales at STULZ GmbH. He will tell you all about the "AirHandler" efficient air cooling solution, and show you how the efficiency of STULZ air handling units can save you money. 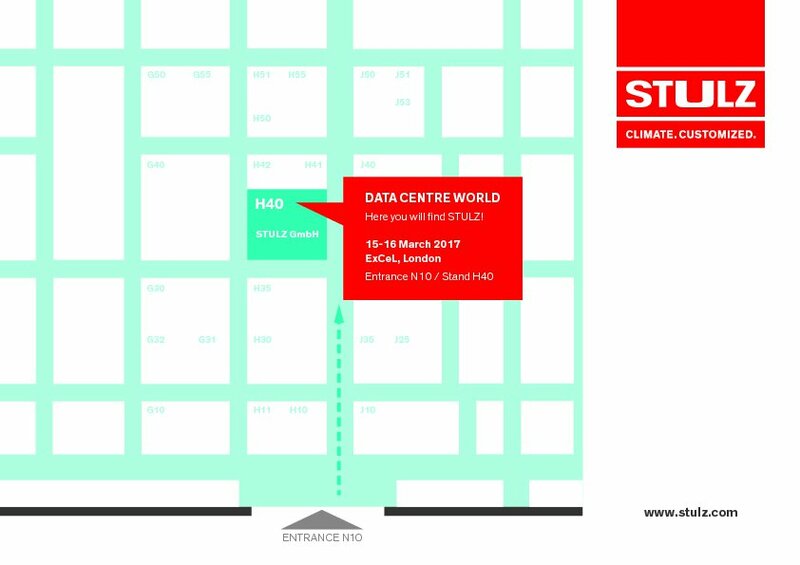 2017/3/16, 10:15-10:44 am, presentation: "Solving data center industries' lesser known problems with DCIM"
Simon Johannes is Innovation Manager responsible for DCIM management at STULZ GmbH. In his presentation, he will show the latest generation of a Data Center Infrastructure Management solution. You can increase the operational reliability and energy efficiency of your data centers to the max with just one central software solution. 2017/3/16, 11:15-11:45 am, presentation: "Chillers: SIZE MATTERS"
Jürgen Römer is Head of Product Management at STULZ GmbH. The requirements for chillers regarding energy efficiency, a lower noise level, and high flexibility are becoming ever more stringent. Jürgen Römer will shed light on the technical concept that unites all these requirements. Maximum energy efficiency and optimum reliability for complex, sophisticated chiller solutions without compromise – this is what our CyberCool 2 chillers stand for. A completely novel overall concept ensures a high degree of energy efficiency with lower noise emissions. Data centers from TSI are bespoke solutions – from smaller containerized solutions to enormous installations with a high performance density for supercomputers.